Right by the Bow River bike-pedestrian path and flat prairie parkland, is Fort Calgary. 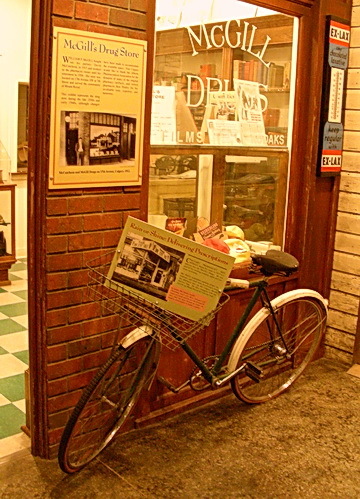 Once a station for the North West Mounted Police who were part of Calgary’s historic development. Indeed, the police are part of the Canadian prairie and northern history for law enforcement. Now, we know them at home and abroad, as the Royal Canadian Mounted Police. That red jacket coat somehow adds recognizable dignity to off-set their hats –a real contrast to some other police forces in other jurisdictions, with a similar hat but duller or darker jackets. Royal Canadian Mounted Police waiting by a 2010 Winter Olympic torch relay at 37th St. detachment office. Vancouver, BC 2010. Photo by J. Chong. Over the past few years, there has been media coverage shining on the nature of management within the RCMP –some of it negative. But what else is new? The police are no more immune from at times, flawed management and personnel problems than any other organization. This blog post is more on bits of fact and memory. 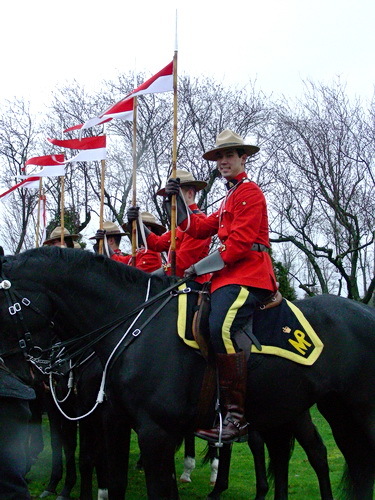 For those outside of Canada, the RCMP at least, to most Canadians, only wear their wonderful red jacket uniform, dark pants and high top riding boots for ceremonial occasions and certain public events. So not surprisingly, a cavalary of RCMP officers were happily and ceremoniously astride their magnificent black groomed horses during the 2010 Winter Olympics flame torch relay run by Queen Elizabeth Park. It wouldn’t be surprising that the huge crowd clustered admiringly around the RCMP and horses, were primarily locals. By that time, Vancouver already had hundreds of thousands of Olympic visitors jamming the city. That is how rare it is see the RCMP in red uniform on horses, outside their local detachment office on 37th St. in Vancouver. Odd as it may seem, it wouldn’t be surprising that probably alot of Canadians don’t mind abit of their tax dollars spent on a touch of occasional police ceremony and red jackets: it’s fantastic Canadian branding and international fodder for near mythic iconic images. Jack had mentioned that the ever-popular Canadian Broadcasting Corporation (CBC) television series, Due South was popular in Germany. The RCMP officer, Constable Fraser, was played by actor Paul Gross and accompanied by his beloved police dog, Diefenbaker (a former, crusty Canadian Prime Minister). I was sorry when the series was pulled off the air since its occasional wry, but polite humour and less bombastic police chase-arrest enactments, were a welcome relief from other continuously violent shoot-and-hurt-or-kill police television series. Back to the RCMP at the Olympic torch relay: they stood the whole 2 hours or more, just posing gamely for the crowd. However it was gentle type of enforcement since the officers were sitting on healthy looking horses, calm but ready to leap off into a canter if required. Several times along the Olympic relay route, the police in regular uniform, did ride their horses for crowd control when the crowd began to press in, as we did in Chinatown. 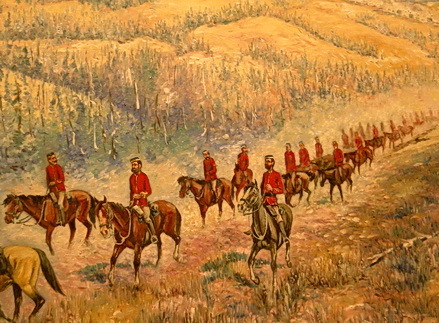 During the late 19th century, at Fort Calgary, there were fragments just to remind us the officers stationed out in the lonely cold prairies near the turn of the 19th century, were subject to their own human frailities. Fort Calgary had their own physician for their officers to treat illnesses and diseases, including venereal disease. They also had enough of their own problems with drunken officers and other police misdemeanours. Errant officers did do some jail time. No doubt some of the police exceeded their beer intake which they were allowed to purchase from their canteen for an hour each day. 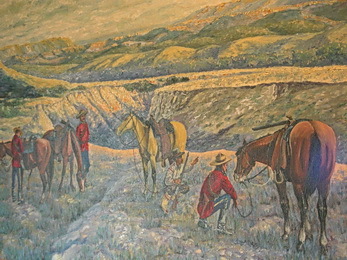 For survival, the North West Mounted Police had their own garden to grow some food at Fort Calgary. Still, for a young man preferring the outdoors, freedom and adventure along with a cache of benefits –a respectable job, accommodation, some food, a horse and medical care, becoming an officer for the Canadian North West Mounted Police was not a bad ticket in life. Hi Jean. I am very new to this blogging world and and finding all sorts of interesting blogs like yours. I lived in Montreal for a short time and it was when the local police went on strike and the RCMP were called in to restore order. And I have a friend in Toronto whose partner is a retired member so I am always interested to read about the force. We too had Due South here in New Zealand for a short time – didn’t last for long and I don’t know if that was because it wasn’t popular here or because they didn’t make any more. I would really like to subscribe to your blog but can’t work out how. Please let me know. Thanks for dropping by. I believe there is another RCMP museum-like facility somewhere in Saskatchewan. 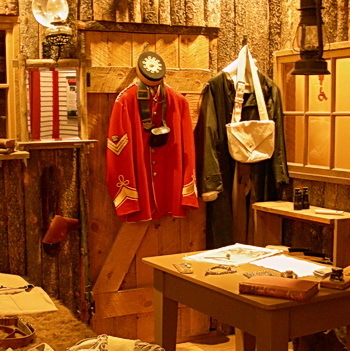 Thanks for the local detailed summary about the main RCMP museum in Regina, Saskatchewan. It certainly looks alot bigger than ours here in Calgary. 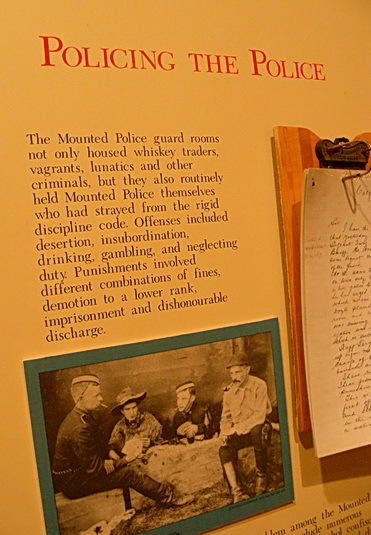 It would have been interesting if one of the museums, did have an exhibit that highlighted how the image of the RCMP was used in historic Canadian posters, movies and TV series.